For this artist's self titled album, see Billy Ocean (album). 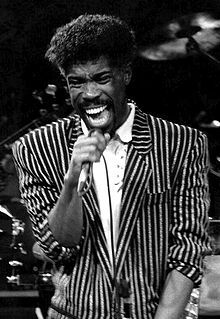 Billy Ocean (born Leslie Sebastian Charles; 21 January 1950) is a Trinidadian-English recording artist who had a string of R&B international pop hits in the 1970s and 1980s. He was the most popular British R&B singer-songwriter of the early to mid-1980s. After scoring his first four UK Top 20 successes, seven years passed before he accumulated a series of transatlantic successes, including three US No. 1's. His 1985 hit "When the Going Gets Tough, the Tough Get Going" reached No. 1 in the UK and No. 2 in the US. In 1985, Ocean won the Grammy Award for Best Male R&B Vocal Performance for his worldwide hit "Caribbean Queen (No More Love on the Run)" and in 1987 was nominated for the Brit Award for Best British Male Artist. His 1988 hit "Get Outta My Dreams, Get into My Car" reached No. 1 in the US and No. 3 in the UK. In 2002, the University of Westminster, London, awarded Ocean an honorary doctorate of music. In 2010, Ocean was presented with the Lifetime Achievement Award at the MOBO Awards. On 29 July 2011, Ocean became a Companion of the Liverpool Institute for Performing Arts, presented to him by Sir Paul McCartney. He is a member of the Rastafari movement. Ocean was born as Leslie Sebastian Charles in Fyzabad, Trinidad and Tobago, to Hainsley Charles, a Grenadian musician and his wife Violet. His family moved to Romford, London, England, when he was ten years old in 1960, just before Trinidad and Tobago became independent. He was exposed to music at an early age. During his teenage years, he sang regularly in London clubs while also working as a tailor in London's Savile Row. He was discovered by his first manager, John Morphew, who recorded a double A-side single at Pye Studios in London with a full orchestra. However, the ballad singing style of Les was going out of fashion and Morphew was unable to get any major label to release it. It remains unreleased. Les's father—who had countersigned the management contract as Les was underage—asked Morphew to release him from contract, which he did without penalty. In 1969, he joined a local band, The Shades of Midnight, playing in the Shoreditch area of London. He recorded his first single, "Nashville Rain", backed with "Sun in the Morning" in 1971 for Spark Records as Les Charles, and for two years fronted a studio band called Scorched Earth, with whom he released "On the Run" backed with "Let's Put Our Emotions in Motion" in 1974. Ocean took his stage name from the Ocean Estate, Stepney in London's East End, where he was living at the time. In 1976, he recorded his first album, Billy Ocean, with its first single release, "Love Really Hurts Without You", charting at No. 2 in the UK Singles Chart and No. 22 in the US Billboard Hot 100. He enjoyed club success from the songs "Are You Ready" and "Stay The Night" from the album City Limit—both of which were later covered by La Toya Jackson. More successes ensued, including "L.O.D. (Love on Delivery)". He also wrote and composed songs for other artists. In 1981, he scored the US R&B chart with "Nights (Feel Like Getting Down)." Ocean's period of greatest success began with the releases, during 1984, of the album Suddenly and its main single, "Caribbean Queen (No More Love on the Run)". The song's title and lyrics were changed for different regions, such that the song is also known as "African Queen" or "European Queen". The song won Ocean the Grammy Award for Best Male R&B Vocal Performance at the 1985 Grammy Awards and was also nominated for Best R&B Song, losing to "I Feel for You" by Prince (songwriter). Ocean was later presented his award by Shalamar group member Jeffrey Daniel on 620 Soul Train, a UK incarnation of the American music dance show Soul Train. The album's title track also became a success, peaking at No. 4 in both the US and the UK and the song "Loverboy", while also being a No. 2 US success in 1985 was also featured in the first scene of the popular UK BBC One TV series Casualty, in 1986. Ocean appeared at Live Aid in 1985, singing "Caribbean Queen" and "Loverboy", from JFK Stadium in Philadelphia. His 1986 album Love Zone also sold well. It included the successful singles "When the Going Gets Tough, the Tough Get Going", the theme from the film The Jewel of the Nile; this was a No. 1 success in the UK and a No. 2 in the United States; and "There'll Be Sad Songs (To Make You Cry)" (a US No. 1, and also a major UK success). Also included were the title track and "Love Is Forever", which were No. 10 and No. 16 US successes for Ocean, respectively. It also earned Ocean a second nomination for Best Male R&B Vocal Performance at the 1987 Grammy Awards. In February 1986, Ocean's video of "When the Going Gets Tough, the Tough Get Going" was banned by the BBC, owing to such non-union members as the American actors Michael Douglas, Kathleen Turner and Danny DeVito, all three of whom were cast members of Romancing the Stone and The Jewel of the Nile, miming to the backing vocals. At the 1987 Brit Awards, Ocean was nominated for the Brit Award for Best British Male. Ocean's next album, Tear Down These Walls (1988), featured another No. 1 single, "Get Outta My Dreams, Get into My Car", while the album was certified platinum. Ocean's 1993 album Time to Move On failed to produce any major successes, but his 1989 Greatest Hits collection has been a steady seller over the years, and his 1997 compilation Love Is For Ever made No. 7 on the UK album chart. Ocean's last studio album for Jive Records was Time to Move On, which he recorded in Chicago with R&B star R. Kelly. R. Kelly had been a longtime admirer of the way Ocean was able to mix the more emotive soul style with a crossover popular style. In 2002, the University of Westminster in London awarded Ocean an honorary doctorate of music. The awards ceremony took place in the Barbican Centre, in London. He continues to tour and record in Europe. Ocean is now a patron for Tech Music Schools in London, made up of Drumtech, Vocaltech, Guitar-X and Keyboardtech. He regularly visits to hold clinics and seminars for the students. In 2004, "Caribbean Queen" was re-released as a digital single for its 20th anniversary, shooting up to No. 25 on the Billboard digital singles chart and garnering radio play across the United States and UK. A remix of the single by will.i.am was released in 2005. In October 2007, Ocean commenced his first UK tour in more than 15 years. In February and March 2008 he toured Australia and the Far East. His album Because I Love You was released on 2 February 2009. In April 2010, an 18-track compilation album was released in the UK by Sony Music titled The Very Best of Billy Ocean to tie in with a 30-date tour of the UK and Ireland. Featuring Ocean's biggest hits, the album debuted in the UK Albums Chart at No. 17. On 20 October 2010, Ocean was presented with the Lifetime Achievement Award at the MOBO Awards in London. On 29 July 2011, Ocean became a Companion of the Liverpool Institute for Performing Arts. His title was presented by former Beatle Paul McCartney. In 2012, Ocean made a cameo appearance in the British comedy movie Keith Lemon: The Film as Lemon's father. In January 2016, Ocean appeared on The Tonight Show with Jimmy Fallon to perform some of his classic hits as part of a promo tour for his new album. Ocean had a Spring Tour 2017 in the UK during March and April 2017. Ocean lives in Sunningdale, Berkshire with his wife Judy, and has done so since 1978. They have three children: Cherie, Anthony and Rachel. Anthony played rugby sevens at the 2014 Commonwealth Games for Barbados. Ocean has been a vegetarian since 1992. 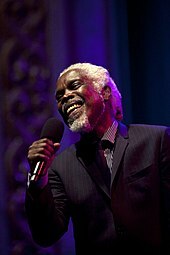 Billy Ocean has been nominated a total of three career Grammy Awards, with one win. ^ a b Roberts, David (2006). British Hit Singles & Albums (19th ed.). London: Guinness World Records Limited. pp. 402–403. ISBN 1-904994-10-5. ^ a b "Billy Ocean BRITS Profile". Brits.co.uk. Archived from the original on 25 October 2014. Retrieved 19 September 2014. ^ a b c "Billy Ocean will be named a LIPA companion by Paul McCartney this afternoon". liverpoolecho. Retrieved 19 September 2014. ^ Davina Hamilton. "Billy Ocean: 'Rastafari is my anchor'". Voice-online.co.uk. Retrieved 19 September 2014. ^ Billy Ocean (28 April 2009). "Celebrity travel: When the going gets tough the tough hit Grenada". The Daily Mail. Retrieved 2 November 2014. ^ a b c d "Billy Ocean – Biography – AllMusic". AllMusic. Retrieved 19 September 2014. ^ "Billy Ocean". Northwales.co.uk. Retrieved 2 November 2014. ^ Pete Lewis. "Billy Ocean: Caribbean King". Blues & Soul. Retrieved 1 January 2012. ^ Tobler, John (1992). NME Rock 'N' Roll Years (1st ed.). London: Reed International Books Ltd. p. 415. CN 5585. ^ "Whatever Happened To (weht.net) – accessed January 2008". Weht.net. Retrieved 19 September 2014. ^ "Page not found – Retroland". Retroland. Archived from the original on 28 March 2010. Retrieved 19 September 2014. ^ Chris Osuh (25 October 2007). "Billy Ocean @ Opera House". Manchester Evening News. Retrieved 19 September 2014. ^ "Because I Love You (CD)". Tower Records. Retrieved 19 September 2014. ^ Pete Lewis (May 2010). "Billy Ocean: I've Got Somethin' To Tell Ya". Blues & Soul. Retrieved 19 September 2014. ^ "Tinie Tempah, JLS Big Winners at MOBO Awards". Billboard.com. Reuters. Retrieved 21 October 2010. ^ "Billy Ocean's son thrilled with All Blacks encounter". ESPN Scrum. 24 July 2014. Retrieved 27 July 2014. ^ a b c d "Billy Ocean". Grammy.com. 22 May 2018. Retrieved 4 August 2018. ^ "GWAR covers Billy Ocean". Avclub.com. Retrieved 19 September 2014.